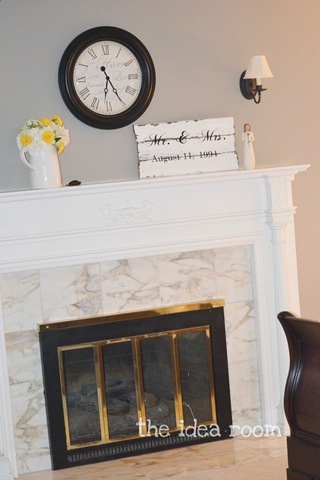 So…as some of you may know…if you follow The Idea Room FB page, that I have been painting and sprucing up our Master Bedroom which has been the same since we first moved into our home almost 9 years ago. And for me, who grew up rearranging her bedroom every few months, that is a LONG time with no change. 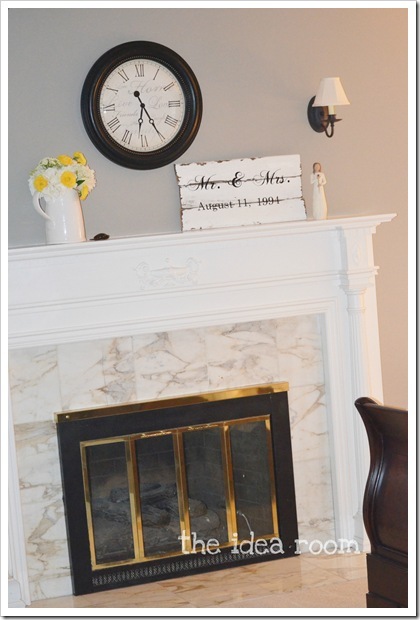 With the new paint color, we had to get a couple of new décor items. 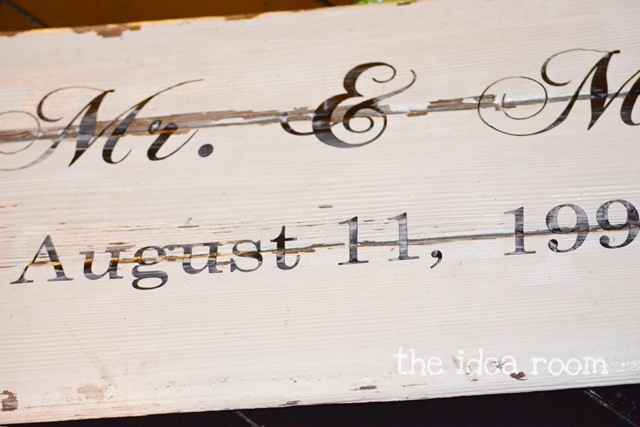 I thought it would be fun to make a sign that was unique to our wedding date. I was inspired by a wedding photo I saw where the bride and groom were each holding their respective signs. 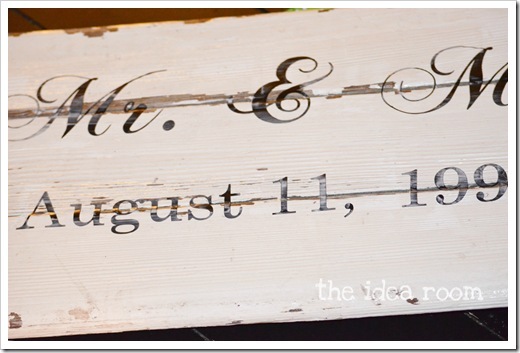 I knew I wanted to use some weathered wood and had the perfect wood to use. We “inherited” this old beat up garden swing when we moved into our home from the previous owners. It was broken but I always had plans to fix it up and use it. But it never happened. We had slated it for the garbage man and the morning it was to be hauled off I knew I had to rescue it. So before my husband left for work he rescued it out of the garbage can. Phew…disaster averted. We cut the wood off the swing using a reciprocating saw. Then I took 3 of the wood planks and glued them together with some left over wood scraps on the back. 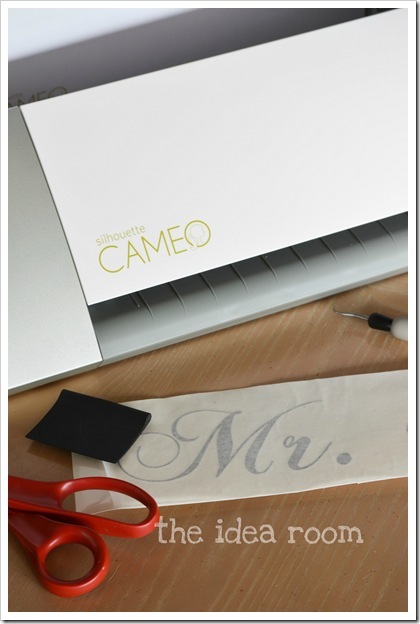 Then using my new Silhouette Cameo machine, I cut some vinyl for the Mr. and Mrs. using the ChopinScript font. 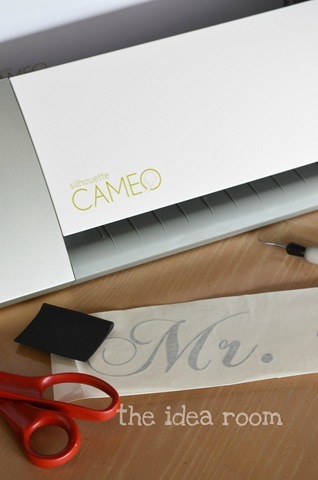 Carefully add the vinyl lettering to your sign. Then, I added a thin coat of Mod Podge (Matte finish) to the sign. I did this because the paint was peeling off. I did not want to lose any more of the paint or have it shed in my room. I also wanted to keep it just the way it was. I really like the personal touch it gives our Master Bedroom. 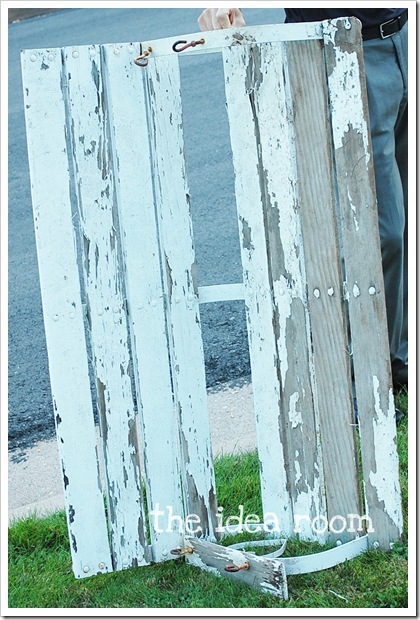 And I have a few more pieces of the weathered wood that I hope to find some fun projects for. Love it! Now, if only I had a Cameo! That is really cute! 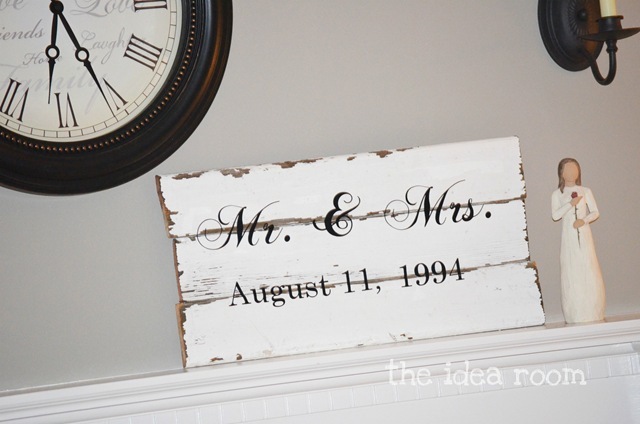 I need to make things like this for decorating. amy i LOVE it!! I really need to add some more personal touches and pizazz to our master bedroom :) Thanks for the inspiration. and the color of the walls is fantastic! it looks like a similar gray to what we painted most of our upstairs…we lo-o-o-ove it :) Hope you two are enjoying the new look of your room! 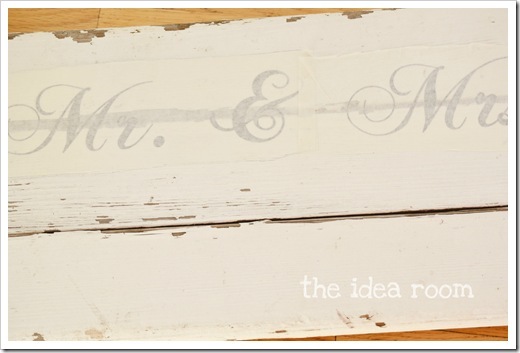 What a gorgeous sign, I love that idea! Makes me want a Silhouette Cameo so BAD! Totally love the sign!! So glad I found you via The Shabby Creek Cottage. I look forward to following your blog! I LOVE THIS! and it looks like something I could pull off doing! 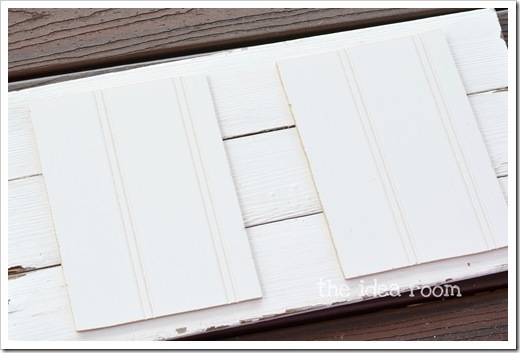 :) I’m in the middle of a major overhaul of my family room & this little idea might just come in handy ! Thanks 4 sharing! I adore this sign!! Great job!! I just bought the cameo the other night. Can’t wait for it to come! & I love this idea! Oh and I just have to know, what is the font that you use for all your blog post titles? I have been searching for this font for a long time. I saw it a long time ago in a magazine and loved it. Thanks so much!! I think I did a little swinging on that swing when I was younger. So funny! I am glad to see it got put to good use instead of going to the garbage. It looks great! Great idea! Can this be “pinned”? I’d like to save the idea and share the idea! I love the sign! I’ve been going Cricket happy lately, and I inherited a lot of old wooden pallets. 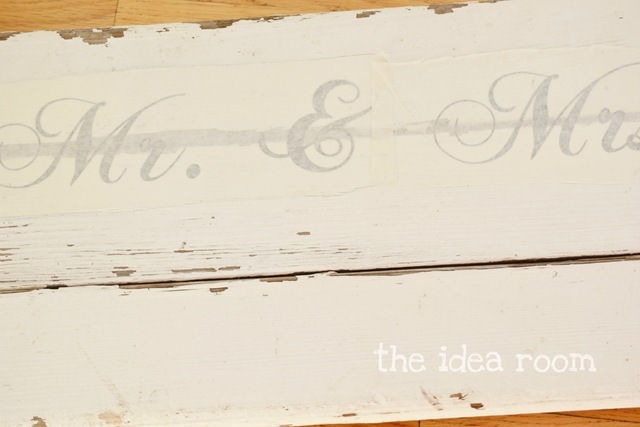 We’re redoing our bedroom, too, and I’ve been wanting a Mr. and Mrs. sign somewhere! 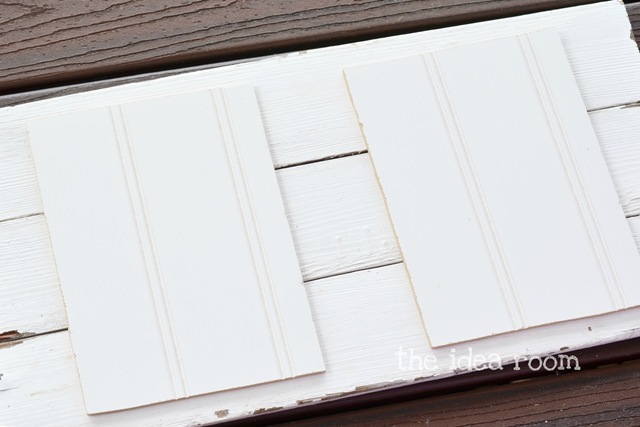 I’ve just found your blog, and I must say, I’m feeling pretty crafty now! BTW August 11th is a great anniversary! Our is August 11, 2003! I love this idea. When my husband and I were dating he would drive 60 minutes every Wednesday, after my kids from a previous marriage were in bed, just to sit on my front porch swing and talk. 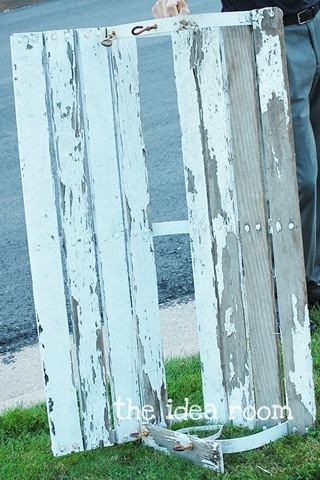 Now the swing is falling apart (3 years of marriage later) and I would love to make it into an heirloom type sign for our home! Gotta love crafty folks like yourself…. 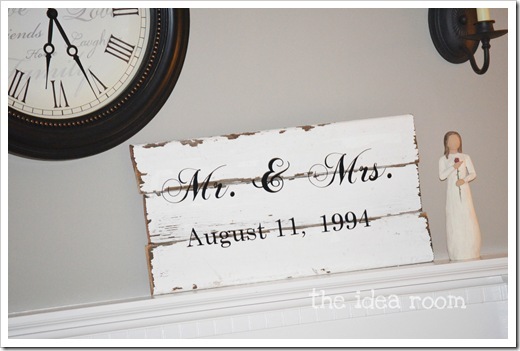 What a fun idea and would be a great sentimental piece! Hope you can make it into something you will cherish!